Fidelity vs. Sound: Which Is Better? During the recent T.H.E. 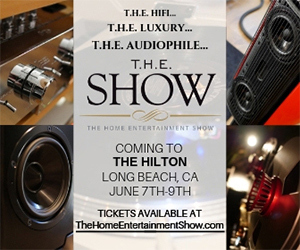 Show I told several attendees that I intended to write a post comparing fidelity vs. sound. They are not the same thing. The background for this post comes from a variety of sources. I’m sure a prominent piece comes from conversations I’ve had with advocates of analog audio and vinyl LP supporters. A fellow booth partner in Munich strongly disagreed with my insistence that digital audio can deliver far greater fidelity than the than his cherished turntable. 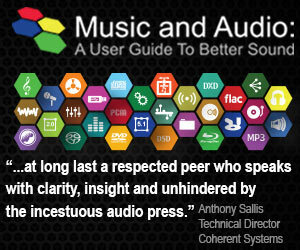 His defense of analog audio? That the resolution of vinyl LPs and analog sound is “infinite” while the resolution of CD and even high-resolution sound files is limited to 16 or 24 bits! Crazy talk to those of us that understand the technical underpinnings of digital sampling and information theory. But his misunderstanding of the subject is not surprising. Even seasoned writers on mainstream audio websites advocate for analog systems and formats for the “intangible quality to the sound of all analog media” or “a quality of presence from all-analog media that I really don’t hear from my best digital sources; although, things are getting better all of the time”. The subjectivists and their tilt to personal preference over technology/science remains a mystery to me. If the assumed goal of high-end audio reproduction is to recreate the sound of a live musical performance, why would anyone defend an all analog system? The shortcomings of analog are well known. The lack or inability to capture real world dynamics is among the most serious. A loud rim shot fails on analog media. Unnatural dynamics compression technologies — called compressors or limiters — are used in studios and in live concerts to tame any sudden outbursts like that. But PCM digital — especially systems running with 24 or 32 — need not fear from similar loud moments. The dynamic range of a moderate PCM based digital system is orders of magnitude better then the best analog formats. The gentleman that stopped by my AIX Records booth at the show with a bag full of vinyl LPs echoed the statements made by the journalist above. “I’ve been listening primarily to vinyl over the past couple of years because I get more emotionally involved with sound of an LP”, he told me. So I asked him whether he had any experience with real high-resolution PCM digital masters? He replied that he had initially tried some “high-res music” downloads from HDtracks and other sites but found that they lacked the same sense of depth that he got from his vinyl. He fell into the same trap as most other listeners. He hasn’t heard real hi-res music. At that moment I asked him whether he had a Blu-ray player. As he said yes, I handed him the latest AIX Records Blu-ray sampler (the one with 72 tracks, three mixes for each track, and videos for most) and challenged him to listen to it and report back. If the tracks on that sampler lacked “emotional involvement” or “presence” or “intangible quality”, I wanted to know about it. I know they lack distortion, wow and flutter, tick, pops, and crackle. My confidence was high knowing the reports that I’ve received from others presented with the same challenge. 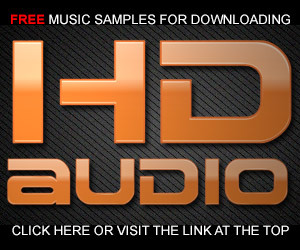 Once you’ve heard real high-resolution audio recordings captured like I produce them, you know. I remember driving my best friend’s 320i BMW (many years ago) for the first time after having driven automobiles made by the big three audio makers back in the early 1980s. The feeling of that BMW was unlike anything I had ever driven before. The same happens to people that hear real high-resolution audio recording from my catalog for the first time. Until you’ve experienced that level of fidelity, you simply don’t know. And the fact is most artists, recording engineers, labels, and audiophiles haven’t heard real high-resolution audio recordings. I would venture that the gentleman with the stack of vinyl LPs under his arm hasn’t heard Destani Wolf singing “Primavera”, Jamie Hanna and Jonathan McEuen sing “Lowlands”, or John Gorka singing “I Saw A Stranger With Your Hair”, which are three of the most engaging recordings I’ve recorded and released. There is more emotion and depth in these tracks than any analog record could ever dream of delivering. Vinyl LPs and analog tapes deliver a “sound”. These analog formats are “warm”, “lush” and possess just the right combination of 2nd order distortion and other imperfections as to make them familiar and comfortable. But they lack real fidelity. 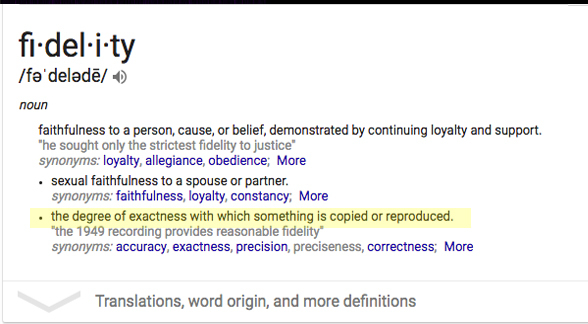 Fidelity is defined as “the degree of exactness with which something is copied or reproduced”. A PCM digital recording — standard or high-resolution — does this far better than analog. The sound coming in a from a microphone can be reproduced from good speakers with full fidelity — just NOT from vinyl LPs or analog tape. PCM digital delivers fidelity and analog formats produce a cherished “sound”. Listeners — and writers — have to decide for themselves which attribute they prefer. Neither is wrong. But they can’t ultimately choose until they tried the best of both. For me fidelity wins hands down. The banner on the right side of this band is your free ticket to some real high-resolution sound files. You can’t know unless you listen. Please give them a try. I haven’t heard back from the vinyl LP guy from last weekend but I did hear back from a couple of other attendees. Fidelity won every time for them. Mark, my favorite tracks to demo sound for people out of the vast number of AiX titles that I own are still the two that Jennifer Warnes sings on Nitty Griity Surround. The way that you have her voice mic’d is phenomenal. I wish I could share the entire album that I did with Jennifer…it’s amazing! Sadly, she won’t allow its release. Hi Mark, thanks for this article. You should have asked that ‘LP guy’, to what hifi system was his bluray player attached. You might have got a rude shock that it was not his main LP system, but some mid-fi movie system. That is what I keep noticing; audiophiles aren’t even giving bluray a chance. This is what I always say to those many audiophiles who are misled into pro-analog positions: “The purest *analog* waveform you are ever going to see from a recording and playback system, is out of the back of a DAC.” It is worth emphasising that the output of a digital system is analog, too. And, compared to the *original analog* electrical signal coming into the recording studio from the microphones on the instruments and singers, the analog coming out of the back of a DAC is the *purest* recreation of that original live signal. By a mile. You want purity, you want truth? That’s it right there. Just keep emphasising that digital is analog too, only it’s purer analog. Grant, brilliantly put. 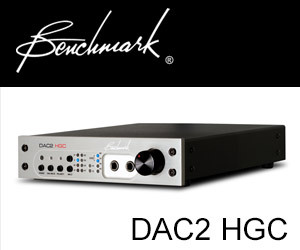 I try to emphasise to people the “purity” of a digital recording inasmuch as the music gets built by the DAC brand new every time you play it. John, I like your ‘fresh build’ idea. The ‘natural/organic/we-live-in-an-analog-world’ argument is so misplaced in this instance as to border on the ironic. That was the point of my post: that people are looking in entirely the wrong places if they want the best possible analog sound, and by ‘analog sound’ I mean the playback medium that can produce analog output most closely resembling the analog input travelling along the mic feeds and instrument feeds in the studios. There is so much hype and shouting about who owns the ‘analog sound’, and yet it’s actually the guy who everyone reckons can’t sound analog by definition, who actually has captured and replicated it the closest, with least corruption. Apart from the analogue artifacts which seem to make vinyl reproduction more pleasant to the ear the dynamic compression is often vastly different too, especially on popular releases subjected to the “loudness war”. Another tick for vinyl sounding “better”. Adele’s album ’25’ for instance. XL Recordings 2015 release displays DR 11 on Vinyl vs DR 5 on CD. No doubt the studio recording was accurately captured but subsequent processing and mastering has destroyed much of the fidelity of Adele’s performance. Sadly, the dynamic range database is based on a broken tool, TTDR, that can give widely different scores when you vary factors *other than* dynamic range. That’s the definition of broken, for sure. Furthermore, the process of preparing mastering files/tapes for LP will always intrinsically embed some of these non-dynamic-range factors into the product, in ways that increase the DR score without being any more dynamic. An extra 5 or 6 points is completely normal for simply merging the bass frequencies, a standard aspect of vinyl production which adds nothing to true dynamic range. Therefore, the DR database is garbage. What’s worse, misleading garbage. What’s worse again, gives an authoritative appearance that has sucked in thousands of audiophiles, and gets used as proof of wrong statements. Wrong statements that have almost certainly guided their gear purchases and music purchases in the direction of (gear and music) that costs typically triple the cost of the CD option. How sad is that! I think in a previous post one of your comments from a contributor was that vinyl had a “sonic comfort zone” which I think is bang on in my opinion. There is a difference between accuracy and what sound quality you may prefer to listen to but surely accuracy (best obtainable fidelity) should be the starting point?, it’s easy enough to use DSP to fiddle about and tweak the sound to your preferred quality. It amuses me when people describe such and such in digital such as DSD as “more analogue like” this is nonsense and confusing, what are they trying to describe? that such and such sounds more like tape or vinyl i.e less fidelity? Nothing wrong with that but please be clearer. And how many of those LP he had tucked under his arm were digitally recorded/mastered? Maybe you should have pointed out to this gentleman that many of his cherished vinyl recordings were more than likely digitally sourced; then what of the “emotional involvement”. Many of these so-called “hi-fi” enthusiasts need to pull their head out of their placebo. I’ve heard this argument countless times before. Until I actually understood sound I was an audiophile but on a fateful day in March 1974 in a surprising unexpected flash of insight I understood sound and acoustics and my life as an audiophile ended just as my life as an audio scientist and engineer began. This had nothing to do with phonograph records versus digital, solid state versus tubes, horn speakers versus electrostatic speakers. It had to do with sound fields. How they are propagated, how they arrive, the relationship between them, how to mathematically model them with equal accuracy of Maxwell’s laws, how to measure them, how to construct them, and how to evaluate them. It’s all based on one set of equations that are universally applicable. About 14 years later the people who invented Wave Field Synthesis as far as I can tell came to exactly the same conclusion through an entirely different route. The two models can be mathematically manipulated to be interchangeable. However, implementing a real world solution with some compromises as I have done has given them problems they haven’t resolved. I’ve exchanged ideas with experts in the field and one of their problems is measurements which they call capture. An impulse response measurement is useless for technical reasons and I almost gave up until I figured out how to measure fields according to my model several weeks later. The other problem is that they have failed to adapt their technology to commercial recordings. Unfortunately I was not invited to a demonstration of WFS at Bell Labs when I worked there a year ago as their Chief Electrical Engineer. Their source was musicians playing live music in their large anechoic chamber and their audience was seated in a large room with about 50 speaker systems, and this time they had some at different heights and even some on the ceiling. What does this have to do with sound and fidelity. Frankly it has to do with the fact that modern audio equipment, as state of the art as you can buy with as much money as it takes doesn’t come remotely close to true high fidelity. The process of RBCD meets all of the criteria of high fidelity of a storage and retrieval system for electrical signals that are supposed to be analogs of music (they’re not) within the limitations of music and human hearing and vinyl simply does not. However, the compromises that must be made to fit the signal onto a vinyl record and the skill of the mastering engineers can make the sound of vinyl records more pleasing than CDs even though neither can produce high fidelity sound from loudspeakers. The compromises of vinyl phonograph records can mitigate to a degree the limitations of the paradigm of current audio technology even though by comparison for their function vinyl technology is junk compared to RBCD. Try burning a CD from a vinyl. Even with uncalibrated consumer, prosumer, and professional audio equipment you should be able to get anywhere from extremely close to indistinguishable. See my patent 4,332,979. The first three figures 1, 2/2a, and 3/3a have to do with a measuring system that was deemed a separate art by the US Patent office. The verbiage was removed but mistakenly the sketches were not. The issue discussed in the article is that people don’t distinguish between a particular, euphonious sound and true fidelity. I believe reproduced sound can be of very high fidelity. There are undoubtedly things that can be improved — speakers being prime among them — but a good high-resolution surround system lights up my endorphins. In a live musical performance almost everything you hear is due to reflections even if you are seated in the first few rows of the audience. These reflections are time varying vector fields whose spectral content changes as the loudness diminishes. Typically higher harmonics diminish about 1/3 to 1/2 as fast at 8 khz as lower harmonics and fundamentals. These fields although in aggregate are the overwhelming majority of the sound energy you hear, the sound coming from any one direction is inaudible by itself, that is it is overwhelmed by sound coming from all other directions simultaneously. Put your ear up to any reflecting surface and you will hear nothing. It is these fields and their relationship to the first arriving sound in time, direction, loudness, and spectral changes that form the essence of the sound field. Without understanding this you don’t have a snowball’s chance in hell of duplicating anything that sounds like it. By comparison the direct sound and its early reflections captured by commercial recordings are dull and flat. There are many differences in their subjective quality as a result of differences in their physical characteristics. Reconstructing these fields is not an easy task. The information you need is not on the recording. At best the reconstruction can only be an educated guess based on extensive experience with live music. Experimenting with it has been a lot of fun and educated me quite a bit being able to change so many variables. So called surround sound is not going to simulate the real thing. If you are going to try to recreate this field with a limited number of loudspeakers, as soon as you point one at the listener you are doomed to fail. The ability to localize the source by ear kills the effects one of which is listener envelopment.. I understand your position. My approach to recording and reproducing music is not to document or recreate a live event but rather to maximize the emotional and intellectual intensity as a result of listening. I believe 5.1 surround mixing enhances that experience. And I’m very excited by beamforming speakers delivering binaural audio. I may be willing to visit Edgar Choueiri’s lab at Princeton University which is an easy half hour drive from where I live. He seems to have made some progress using some sort of head movement tracking mechanism to control time delay differences and loudness differences ITD and ILD between channels. He also attributes HRTF as a factor but I have no idea how he controls that when you tilt your head forwards and backwards. I don’t buy the whole theory of how human hearing determines direction with these three variables since binaural recordings played through headphones meets all of the criteria yet fails. I have my own theory. I consider all ideas and then use critical thinking to see if they make sense. You’d be surprised at how many of them that are taken as truths by experts don’t pass my test. My goals have been to understand, mathematically model, measure, and reconstruct sound fields. They are all based on an AHA moment I had in 1974. Here’s an image of what happens in one place to sound slowed down by a factor of 200. What you see in one minute happened in real time in 1/3 second. It’s a video clip. Clicking on the image may start the video on your default player or you might have to download it. I couldn’t get the video to play, sorry. But I take your contention that the room has a lot to do with how we hear sounds in a live concert. I would push back that direct sounds dominate the percentage of received audio, especially if you’re in a large room and sitting close to the ensemble. This is my miking model as you know. But all of this assumes the producer want to model his or her recording on a real world example. I don’t want that. Try using Microsoft Internet Explorer. Just click on the image. It should start your default video player. Chrome doesn’t seem to work. Out of curiosity I began looking into the Red Book standards. I am awed by how well thought out it is. The redundancies and error detection and correction features built into it are incredible. For recordings of wide dynamic range music such as a symphony orchestra it seems entirely adequate to me and will be very hard to beat if it can be subjectively bettered at all. What an amazing invention especially given the limitations of technology at the time. It’s been a long time since I studied information theory and the hardware has gone through generations of improvements but the basic principles don’t change. While I agree with the essence of your article, and please don’t take this wrong way, I feel that in some ways you may be pushing another myth and that is implying that that a LP record has better resolution than a CD by suggesting to that LP guy he needs hi res to hear superior fidelity to his LPs. You could have given that vinyl guy a CD copy of one of your brilliant recordings and it still would have bettered his LPs. After all CDs are higher fidelity than LPs in any way you can measure it. I suspect however that he will still find his LPs more involving than your hi res file (or a CD copy of your recording) due to the well known placebo effect. Btw, have you ever tried double blinding a test of your recordings between 24/96 and 16/44? Thanks. 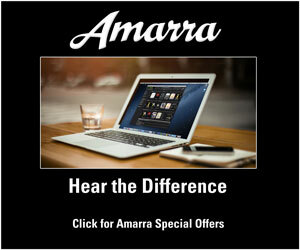 You should take a look at the “HD Audio Challenge” post that I wrote a month ago. Many people are comparing high-res vs. CD res. Not many are getting the answers right. Click here to read the article. I had a read of the article and others before it. I didn’t do the actual test with your files but I have never been able to tell the difference between before between 16/44 and 24/96 with foobar. Your take that most of these tests are invalid because the source recording was not hi res (eg 16/44 or analog tape) is interesting as it presents a variable that was not controlled. I know you probably have other financial priorities, but to settle this (hopefully once and for all) perhaps you and some of your colleagues should consider funding a controlled scientific test (similar to M&M) conducted by a recognised body (such as AES) and publish the study in a well respected journal for peer review. If it is found that people can distinguish between proper hi res and CD quality, or proper hi res and ‘fake’ hi res, it will support what you advocate and would be good for the business. If the study finds no evidence that people can hear differences then at least it would emphatically answer that question. As a digression, after reading some of your earlier articles on analog tape, I thought this study comparing consumer preferences between an all analog recording/playback with all digital might interest you. The study compared sound preferences of university students between either an all analog/playback (tape) recording or an all digital recording/playback (CD) of the same live concert. The recordings were completely unfudged, ie no mixing or mastering processes in the chain – just pure analog v pure digital chains. Geringer, J., Dunnigan, P. “Listener Preferences and Perception of Digital versus Analog Live Concert Recordings.” Bulletin of the Council for Research in Music Education. 1 Jul. 2000, Number 145: 1-13. Thanks for your comments. I would welcome the opportunity to conduct a rigor study — including brain scans — of high-res vs. standard-res. However, as I’ve written previously, it won’t make any difference to the main stream record business. The fidelity of music is less about the format of delivery and more about the methods used to create the master.